The Apprenticeship Housing Maintainer program is a Provincial Certification program that is recognized in Nunavut and NWT. The program offers technical training typically completed over 3 years (levels 1-3) that includes 560 hours of on-the-job training, and for Nunavut, 8 weeks of theory (or 240 hours) per year. This Apprenticeship program’s academic and technical training ensures learners are able to apply theoretical knowledge to practical application as a Certified Housing Maintainer. Learners train with a variety of tools, techniques and materials in well-equipped shops. Trade-specific Math and Science form part of the curriculum. The Apprenticeship Carpenter program provides four levels of technical training toward the Journeyman Certificate Program. Apprentices will progress in their learning to construct, erect and repair structures and fixtures made of wood or wood substances. This is done in accordance with the local building codes. Carpenters build, assemble, place and dismantle concrete forms; fit and install doors, door frames, window frames and staircases; and apply exterior and interior finish with wood or wood substances. Apprentices learn to read blueprints, do layout work and calculate quantities of materials. This program is based on the Alberta Carpenter Apprenticeship Course Outline. Apprentices must complete 7200 hours of technical and on-the-job training (approximately 1800 hours per year which includes 240 hours credit while attending technical training) to receive certification. The Apprenticeship and Oil Heat Systems Technician (formerly Oil Burner Mechanic) is an Inter-provincial (Red Seal) designated trade that offers technical training typically completed over 3 years. Included are 1,560 hours of on-the-job training and 8 weeks of theory (240 hours) per year for each of the 3 levels. 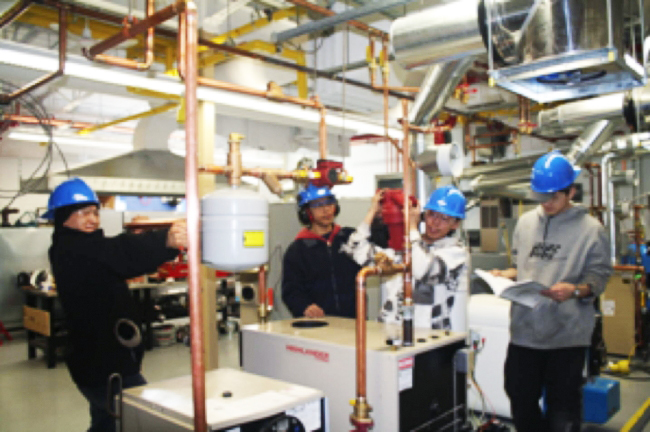 This Apprenticeship program’s academic and technical training ensures learners are able to apply theoretical knowledge to practical application as a Certified Journey person Oil Burner Mechanic. Learners train with a variety of tools, techniques and materials in well-equipped shops. Trade-specific Math and Science form part of the curriculum. 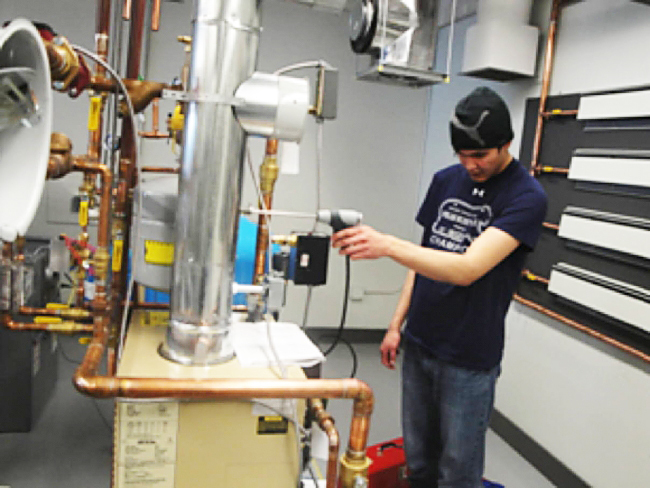 The Apprenticeship Plumber program is an Inter-Provincial (Red Seal) designated trade that offers 6,240 hours of technical training typically completed over 4 years. This includes 1,560 hours of on-the-job training and 8 weeks of theory (240 hours) per year for each of the 4 levels. The College currently offers the first 2 levels of theory. To advance to the next level, students must achieve a 65% grade in theory and 70% on the Government administered exam. Learners who do not pass the Government exam are offered 2 weeks of tutoring with a second opportunity to challenge the exam. Levels 1 and 2 theory cover safety, tools, equipment, materials, plumbing theory, math, and science; blueprint reading, heating, gas line sizing, regulations, water distribution flow, and water heaters. The Apprenticeship Electrician program is a 40-day, multi-disciplinary program that aims to give learners the skills, knowledge, and confidence required to proceed with Apprenticeships in the Electrical Trade. Apprenticeship is post-secondary education with a difference. Apprenticeship begins with finding an employer. Employers hire apprentices, pay their wages and provide on-the-job training and work experience. Approximately 80 percent of an apprentice’s time is spent on the job under the supervision of a certified journey person or qualified trades person. The other 20% involves technical training provided at, or through, a post-secondary institution – usually a college or technical institute. To become certified journey persons, apprentices must learn theory and skills, and they must pass examinations. Requirements for certification—including the content and delivery of technical training—are developed and updated by the Nunavut and Alberta Apprenticeship and Industry Training Board on the recommendation of the Electrician Provincial Apprenticeship Committee.